Hi, everyone! Barbara here with a sweet little card for you today. 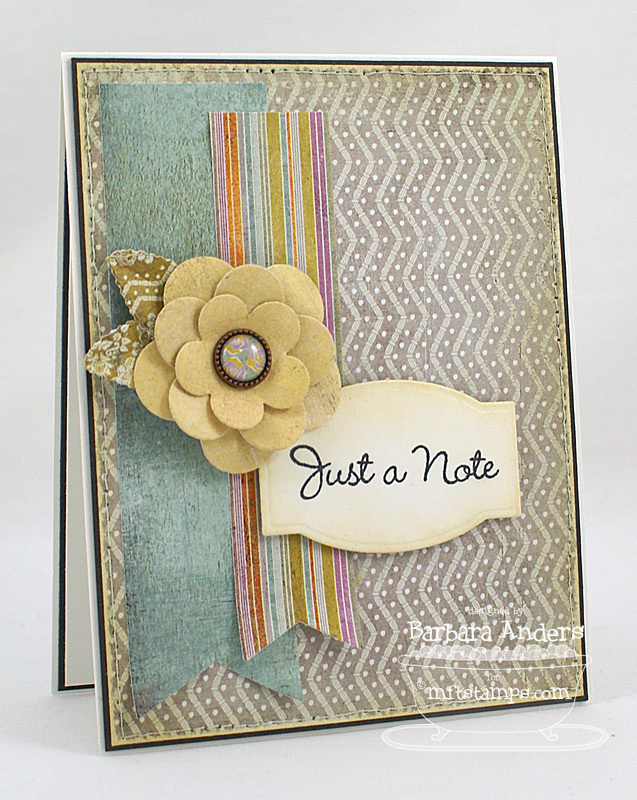 This card is using some gorgeous papers—Basic Grey’s Plumeria. I chose a neutral pattern for my background and I’m not sure if you can tell or not (click on the photo for a closer view), but after I stitched the background paper to my dark gray layer, I sanded the edges with my Idea-ology Sanding Grip Block loaded with Idea-ology Sanding Grip Refill. I use this little gadget all the time—love it for distressing edges as well as for smoothing rough card stock edges. 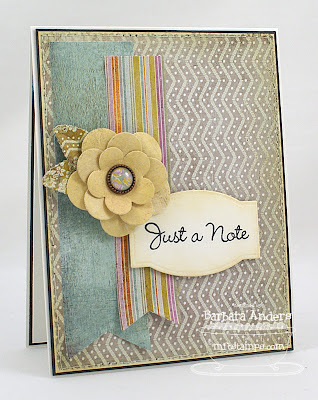 After I sanded, I sponged the edges with my Inkssentials Foam Blending Tool and Antique Linen Distress Ink. I then added some colorful die cut strips, adhering them with some Dot N’ Go - Mini Glue Dots, then I added a sentiment stamped with Memento Tuxedo Black ink and popped up on Scotch Foam Mounting Tape. Finally, I made a flower using a brad from Plumeria – Mixed Brads for the center. And that's it for me today! Thanks so much for stopping by! Be sure to check back in tomorrow when my girl Broni will, I'm sure, have something to WOW you! what a beautiful and sweet card! thanks for sharing, just found your blog today, omw my daughter is going to college in Portsmouth, NH omw I need to find you soon time for a trip down to see my girl and little shopping. Pretty card, and I like the flower. Good to see you here!